How To Take Hair Care And Self-care After A Hair Transplant? There is absolutely no need to sit back at home if one is feeling absolutely fit after the hair transplantation procedure. This also demands that the one s not engaged in hectic and stressing work as this can negatively affect the transplanted hair. If one is into a job that requires a lot of manual labor or the job is stressful, one should abstain work for a period of two weeks to let the scalp heal and the hair to become stronger at the roots. 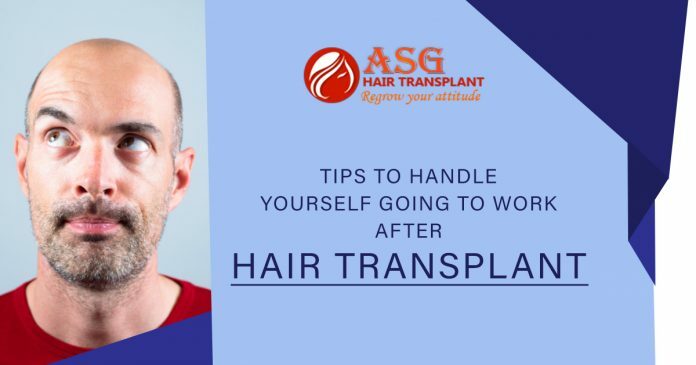 Wearing a hat: this can help to hide the immediate hair transplantation as well as to hide the scars, red marks and scabbing on the head area. This is possible only if there is no issue with the wearing of the hat or prior permission is taken from the office head for the same. The individual can return to work normally without anyone noticing the hair restoration and the marks caused due to the treatment. Taking off for some time: the other option is take off for a week or two which is required for the marks to go and the transplanted hair to accommodate the existing hair. Cutting the hair short: another method is to keep the hair length as much less as possible if one is not ready to disclose about the process. Or, if one is comfortable enough, he/she can go to office flaunting the new hair and encouraging others to get rid of the hair loss with the hair transplant. Overall, public appearance after hair transplantation as one assumes it to be. Still, one should be prepared and confident to present oneself publicly with the new scalp full of hair.